Myths of Mindfulness – How to Unlock the Secrets! Are you struggling with anxiety or depression? Do the myths of mindfulness actually dissuade you? Sometimes depression and anxiety can be caused by negative thinking – judgments of yourself or others – regrets about the past – worries about the future. Developing a mindfulness practice can be helpful in reducing negative thinking and relieving difficult symptoms of depression and anxiety. 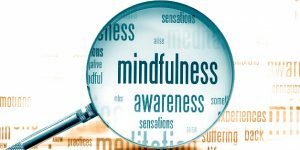 There are many misconceptions of mindfulness, including beliefs that it is all focused on learning meditation or just forcing yourself to be in the present moment. Although developing a habit of formal meditation can be very helpful in reducing anxiety, stress, and irritation, and in helping you to be more mindful, mindfulness skills include so much more than formal meditation. Many people start mindfulness work by trying to be more focused on the present moment. During my many years of working with clients on reducing depression and anxiety through mindfulness, I have noticed that starting there can be very frustrating, and working first on other mindfulness skills can be helpful in the ultimate goal of being present in your present. These other mindfulness skills include being more aware of your emotional experience – noticing how you feel in your body, what you are thinking in your head, naming and understanding your emotional response to situations and interactions with others. Through practice we can also learn how to be more kind and compassionate and less judgmental with ourselves and others. When we can be successful in suspending judgments of ourselves, others, and situations, we create a life where we can be more content no matter what we are facing each day. Two related mindfulness skills are learning how to accept difficult circumstances or let go of past regrets, resentments, or painful memories. Through mindfulness work, we come to realize that accepting difficult situations does not mean that we have to like them. Instead, we focus on acceptance as being a path to feeling at peace even amid circumstances that we acknowledge as painful. We distinguish between pain and suffering where pain is the piece of life that we can’t always control, but suffering is experiencing pain and not accepting this pain, and that kind of suffering is something that we can learn to control in our lives by working on acceptance. We also learn the cyclical nature of letting go – we aim for progress not perfection in our work. Finally, through exercises designed to help us learn to be more aware of our emotions, more compassionate, less judgmental, more accepting, and more able to let go of thoughts and feelings that are causing us pain, we create a space where we can achieve our ultimate goal of BEING HERE NOW. Do you want to unlock the secrets to being more content? Do you want to be able to be more focused and present in your surroundings and with other important people in your life? Would you like to reduce difficult feelings of anxiety and depression? If you are ready to stop missing your life, join our next Mindfulness Group here at New Directions Counseling Services, LLC. The workshop begins February 8th, 15th & 22nd, 2018 on Thursdays from 1:30-2:30pm. Space is limited to 10 participants, so please call now to reserve your spot! By David Morris|2019-01-11T17:26:25+00:00December 18th, 2017|Mindfulness|Comments Off on Myths of Mindfulness – How to Unlock the Secrets!